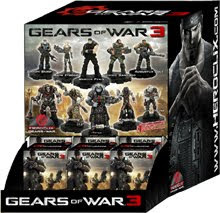 Great news for Gears of War videogame fans, it seems that WizKidz picked up the Gears Of War franchise (just in time for the 3rd game) and will release some GoW themed miniature this summer. This is one of the first attempt to bring GoW characters into wargames, there were some unofficial miniatures like these ones from Reaper (here and here) that have some resemblance with the GoW marines but nobody actually picked up the franchise so far. Would't be great to have some GoW vehicles too?